Not every cleaning company is created equal. But trust the ones that stand behind their word. 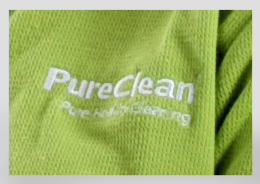 At PureClean, if you are not completely satisfied with a home or business cleaning, we will happily return and re-clean whatever is in question at no additional charge within 24 hrs. we keep in touch with you, the home or business owner, to ensure our cleanings maintain excellence and professionalism. This encourages a strong sense of ownership and dedication among our team who are rewarded for their dedication and hard work. We always welcome any questions, comments or suggestions you have and look foward to communicating with you directly. the #1 priority at our company. Thanks for choosing PureClean. No harmful chemicals in the air or left behind on your floors, furniture and appliances.